The C77NS-7P is a 7-piece nonstick cutlery knife set with acrylic stand. This offers high-carbon stainless steel blades with grooves to keep food from adhering to the blade and make slicing easier. It has comfortable soft grip, and its professional look makes it perfect for any kitchen. This also has protective nonstick coating for long-lasting use. 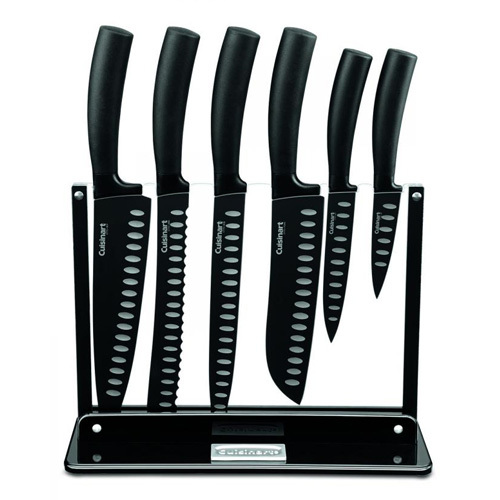 The 7Pc Knife Set W/ Acrylic Stand has many exciting features for users of all types. See the 7Pc Knife Set W/ Acrylic Stand product video above for more details. The 7Pc Knife Set W/ Acrylic Stand is sold as a Brand New Unopened Item.